If you think all cooks and foodies in all cultures are looking forwards for grapes to ripe, think twice! 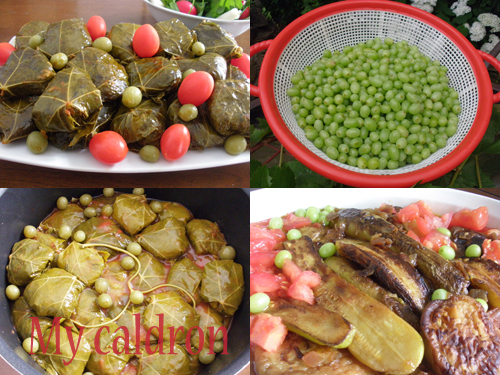 We Iranians have many uses for ghooreh, “unripe, sour grape”, for the lack of a better translation, in our cuisine. Fresh: First off, the season for fresh ghooreh is fairly short – about three weeks in midsummer. That’s when you want to make the most use of it. No matter the form and usage, always start by detaching ghooreh from its stem, pick through, wash and dry. 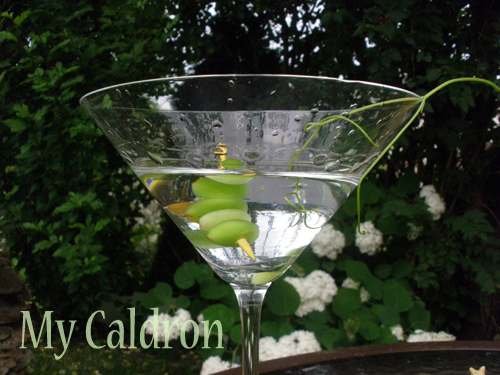 Throw fresh green grapes in salads; spread between stuffed grape leaf (dolmeh), over eggplant stew (khoresh bademjaan), or any Iranian stew you fancy for that matter, AND, and surprise your guests by using them in cocktails, such as martini. This is a good time also to store ghoored in your freezer, as frozen sour grapes taste and almost look as good as fresh ones in stews and drinks. Before packing them for the freezer though, make sure you take off excess humidity by using paper towel. 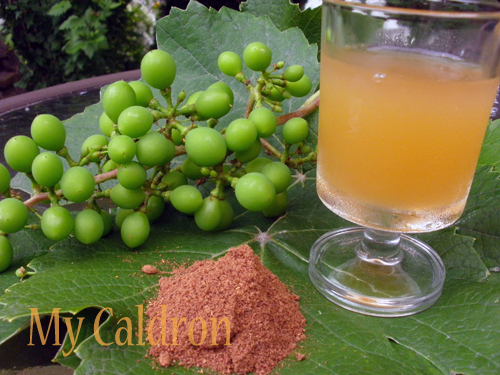 Juice: The most common form of preserving ghooreh is by extracting its juice – known as “verjuice”. Juicing is not complicated at all. You simply choose seedless green grapes (ideally, Asgari type), detached from stems, pick through, wash thoroughly and using a juicer extract the juice. To better preserve the juice it is a good idea to mix some salt in the juice and boil, cool, and keep in sterilized small and sealed bottles. 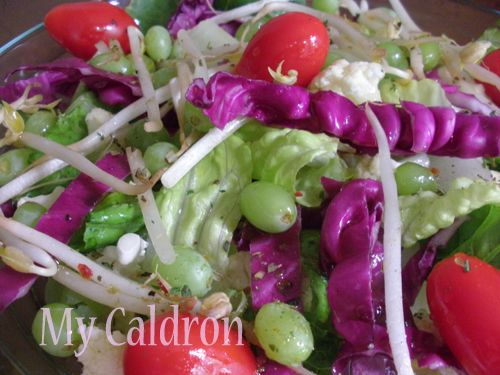 Verjuice is a must in Shirazi salad, but tastes wonderful in any salad, as well as in many stews. Powder: Another way of preserving ghooreh is by sun-drying and grounding it. A more time consuming process but easier to keep and carry compared to the juice. By “carry” I mean, to have it sent to you from Iran by your beloved family back home who provide you with my annual supply of this wonderful spice which I use in my cabbage-mixed rice (kalam-polow), among other things! Paste: I have never tried this one, but I do remember my grandmother used to slow cook mounts of ghooreh in glazed pots until it was as thick as tomatoes paste. Tosrhi (pickle): As if ghooreh was not nasty enough, we marinate and intensity its sharpness and appropriately call it “ghooreh-ghooreh” ! The cleaned and washed whole ghooreh is marinated in a solution of salt and copper (II) hydroxide for 24 hours. Then filtered and washed with cold water several times and let dry. Finally, it is placed in a clean seal-able jar and covered with salt, verjuice and crushed garlic. Oh, my…, just typing up the recipe makes my mouth water!! Ghooreh-ghooreh is used in small bits for stuffing, or stews. A dare to eat in fistful too, when you are a teenager! Not that we eat and drink ghooreh and verjuice for their health benefits, but they do have many, including lowering blood pressure and being an antioxidant.